Anyway they weren’t too embarrassed to be involved in this sock creature activity I devised – in fact we ended up with a whole warren of bunnies – well you know what they say about rabbits. Just a couple of big knots is all you need to make this simple no sew sock creation, so even the youngest crafter can make it with a little help from an adult. 1) Take your sock & fold it out so that the sole & heel are entirely flat (not in half like your usually see socks).Carefully using the scissors cut down the middle of the sock from the toe until you are about 1cm away from the start of the heel. These will be the ears of the bunny so the longer the sock the floppier those bunny ears! 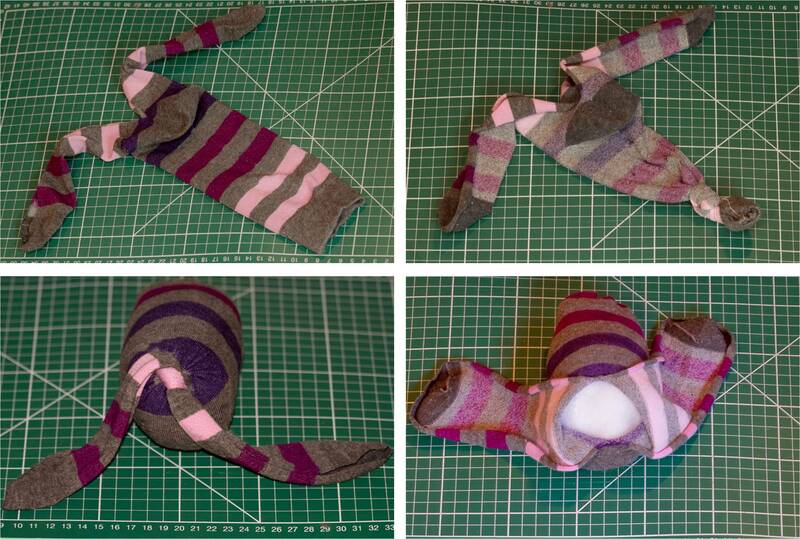 2) Turn the sock inside out. Tie a knot at the cuff end (that’s the bit that holds your sock up) younger people may need some help here. 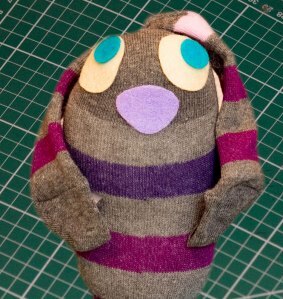 3) Turn your sock the right way round again & using whatever stuffing you have stuff until you reach the top of the opening. Make sure you are happy with the shape. 4) When you’re happy tie a big knot (or two) this closes the body & makes the ears hang down each side. 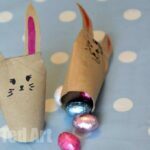 5) Using the scissors carefully cut out different shapes for your bunny face. You can do any kind of face you like – I’ve just kept mine really simple – and glue them on. 6) Your bunny is ready to be released! You can have such fun with these little creatures, let your imagination run wild making bunny families & maybe even designing a warren. 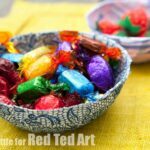 It’s such a cheap & cheerful activity too – that’s got to be a bonus these days! This design may not be copied for commercial purposes. 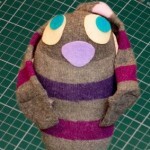 If you enjoyed this post, why not check out The Other Mousie’s shops and see what so on offer!! I used The Englishman’s old socks – had to roughly darn the heel first! Hope he, erm, won’t miss them!! 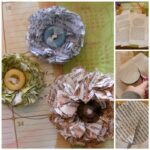 I love the idea of using newspaper or bubble wrap. As I have a 6 month old in the house, I used newspaper in my bunny – nice and safe! When children are older, you could use fun buttons as eyes too! An old pillow case and jeans scraps for eyes and nose! Done. Took me 10min. As I write, Red Ted is napping, but I know he will be VERY excited to meet this little fella once he gets up. Bunnies rock in our house! OH this is just so cute and and a wonderful idea.. Thanks for taking the time to join in and play along. I loved this cute idea. Enjoy your weekend. Thanks again.. 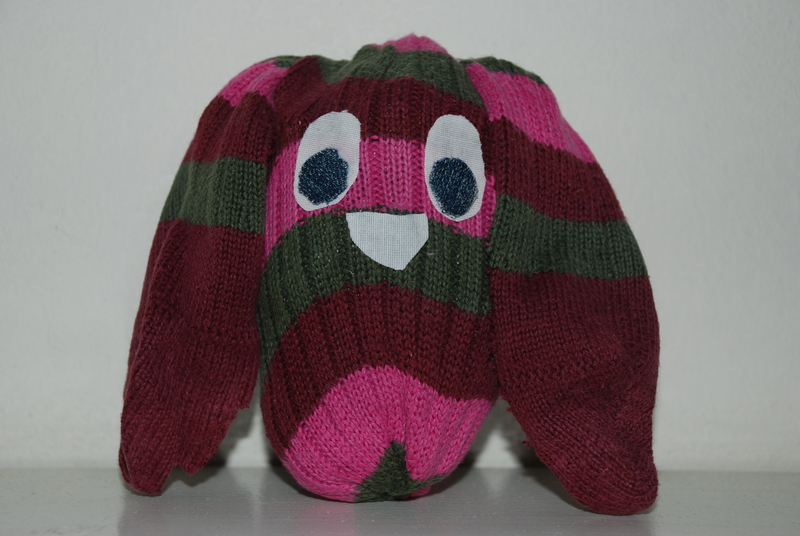 These sock bunnies are just too cute! What a cute sock idea. Very cute! My kid would love to make one of those! Might have to make one for the baby GS! Adorable!!! 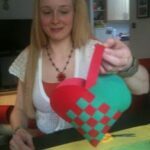 Loving this cute crafty blog, I’ll follow for more fun! Oh lovely! So pleased to have you on board!! What an amazing transformation! You are so clever! So cute! You could make a whole forest of sock friends! Lots of single socks around here! You’re right- different materials and fuzziness, could make a totally different character. Awwww. 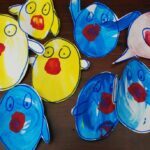 These are so cute and little ones can help make them too. I love it! Thank you for linking! Soo cute! Thanks for linking up to Tot Tuesdays! Too cute! Will do this with my kiddos. Thanks! Hi I am a new google follower of yours – got link from Tip Me Tuesday. 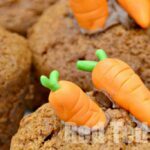 What cute bunnies – and so easy to make too! 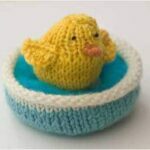 Thanks for linking to a Round Tuit last week! – tried to stop by at the weekend to thank you but the link wasn’t working!